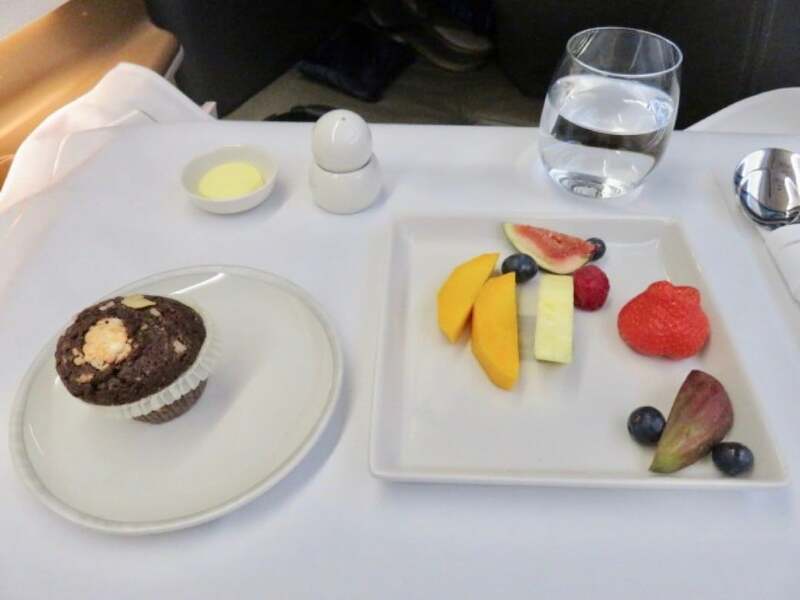 In this trip report I review Business Class on a new Singapore Airlines (SQ) Airbus A350-900 from Düsseldorf Airport (DUS) in Germany to Changi International Airport (SIN) in April 2017. This was followed by a flight on Singapore Airlines A330 in Business Class from Singapore Changi Airport to Ho Chi Minh City. Singapore Airlines has a prestigious reputation, offering great service, delicious food, excellent in-flight entertainment, and the always smiling Singapore air hostess. 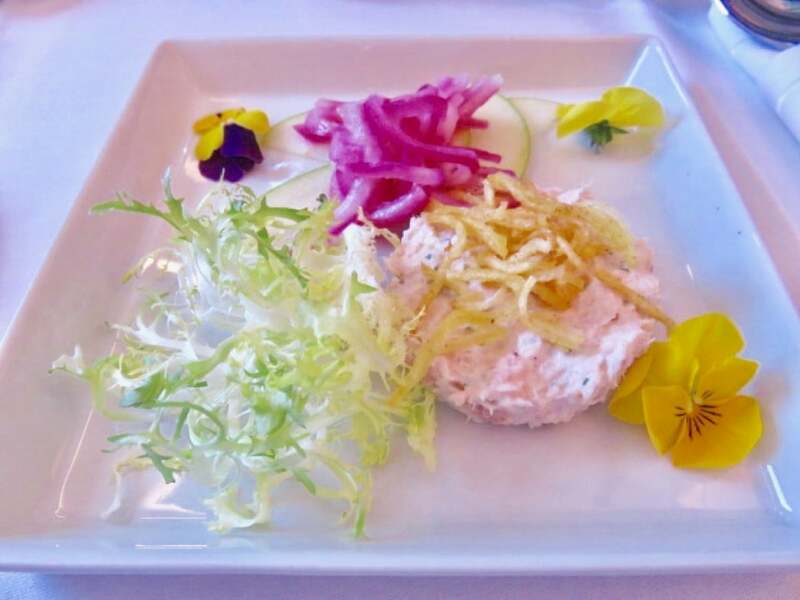 The SQ A350 experience lived up to expectations. The only thing lacking was an amenity kit, possibly a tail camera, and I could have done with a slightly more comfortable flat bed. 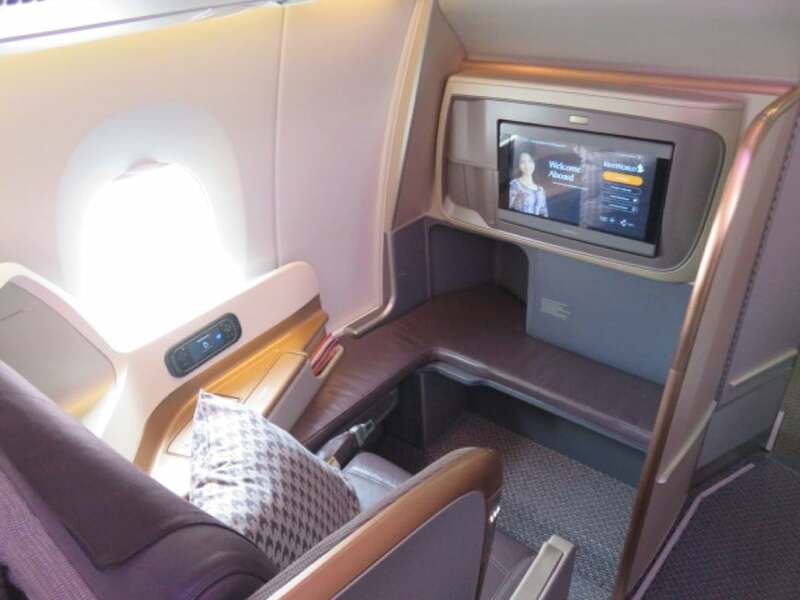 Singapore Airlines features in my top 10 list of the best airlines for longhaul Business Class. I paid 240 euros + 65,000 Miles& More miles for my flight Düsseldorf to Singapore. Miles and More is the frequent flyer program of Singapore Airlines Star Alliance partner Lufthansa. I have reviewed the Lufthansa Business Lounge At Düsseldorf Airport separately which was frankly a disappointing experience. Singapore Airlines currently has 13 A350-900 aircraft in its fleet, with another 56 on order, including 7 ultra-long-haul A350-900ULR variants. 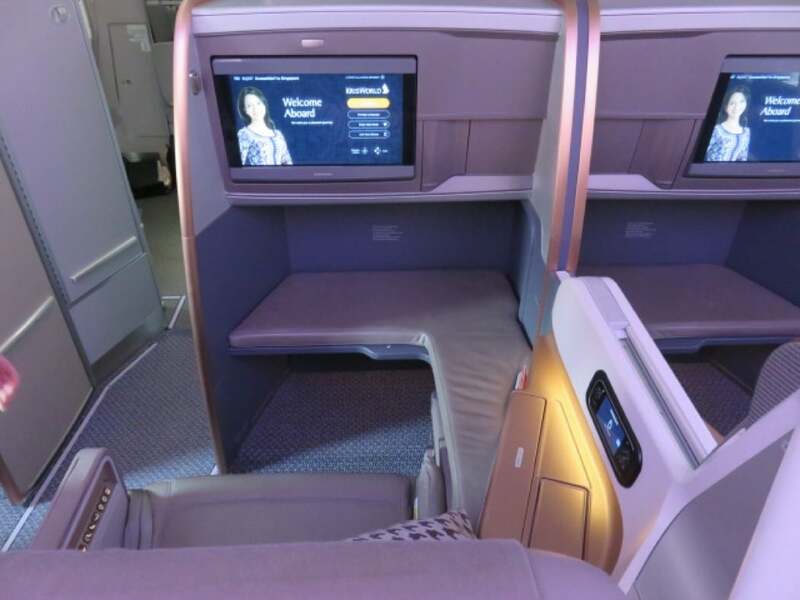 The latter will be used on the Singapore Airlines routes from Singapore to Los Angeles and New York, which – when launched in 2018 – will be the longest flights in the world. 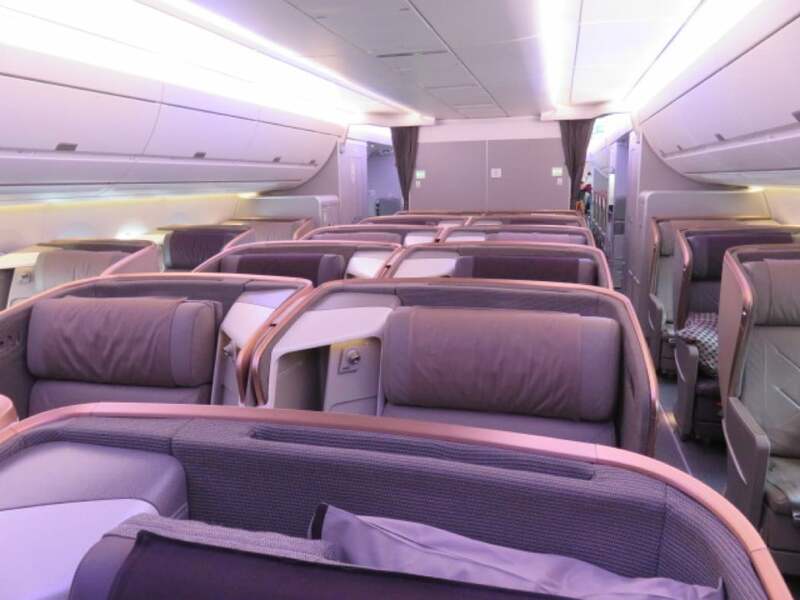 The Singapore Airlines A350 aircraft features 3 classes: Business Class (42 flat bed seats), Premium Economy Class (with 24 recliner seats), and Economy Class (187 standard seats). 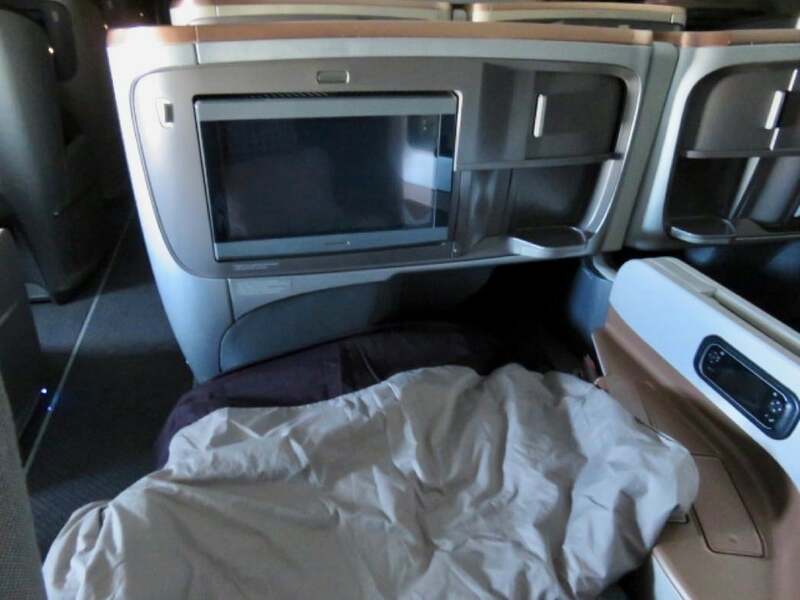 Singapore Airlines does not offer a First Class on its A350 fleet. It is worth noting that Singapore Airlines’s Business Class is better than First Class on most airlines. 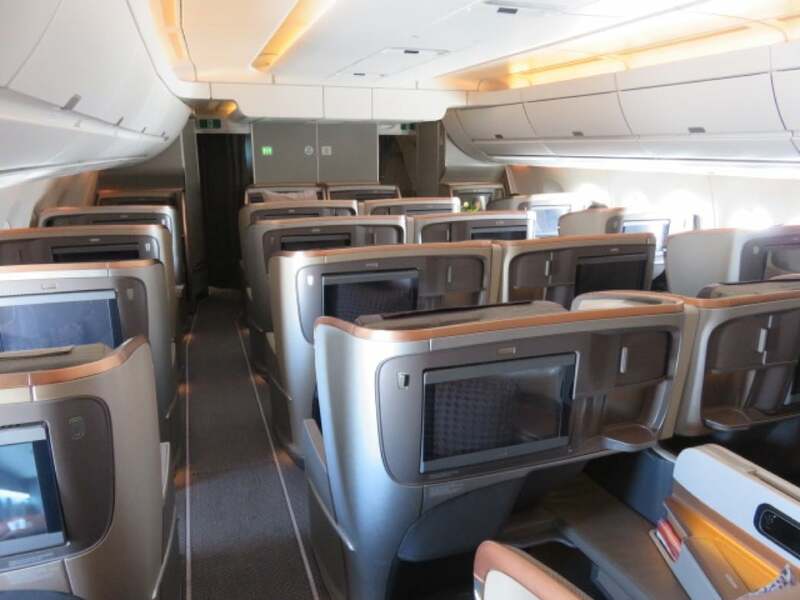 The 42 Business Class seats are spread over 2 cabins: a larger cabin in the front of the plane holds most of the seats (26 in total), while the remaining 16 seats are located in a much smaller and more intimate cabin over the wings in front of the Premium Economy seats. All seats face forward, offer direct aisle access, and are arranged in 1-2-1. The two seats in the centre have a partition screen that can be raised for added privacy. There are no overhead bins above the middle seats, which creates the feeling of space in the cabins. The look of the cabin (by James Parker Associated, the company that also created the opulent interiors of the Orient Express) is a mix of bronzy gold, beige, purple, and chocolate-brown, colours with plush checked throw pillows that contrast with the dark leather seats. See the seat map for the cabin layout. I had selected a window seat for the 11h30min flight to Singapore. 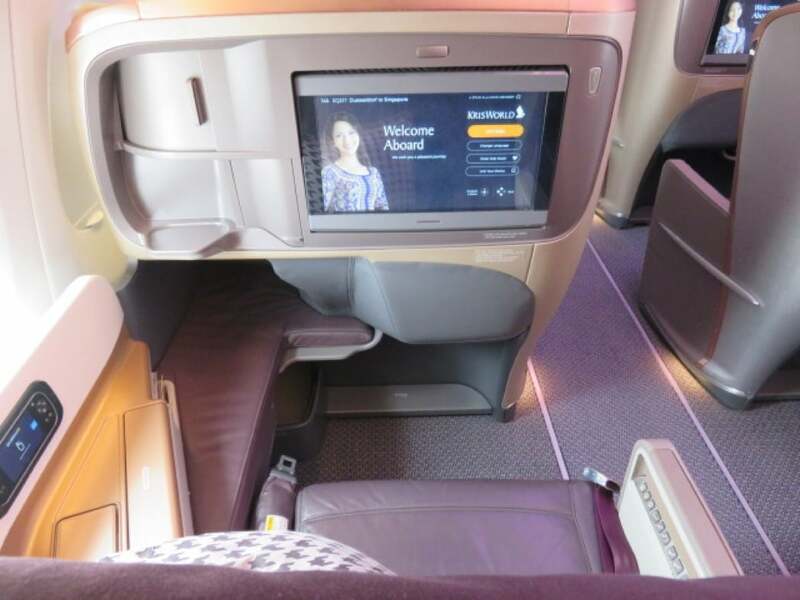 The seat on the Singapore Airlines (SQ) Airbus A350-900 is one of the widest in the industry, albeit slightly more narrow than the seats on Singapore Airlines’s A380 and B777 aircraft. The seat features a pitch of 1,53 cm (60 inch) and a width of 71 cm (20 inch). The suite’s walls are quite high, which gives you a decent level of privacy. One side of the seats featured a reading light on eye level and a control panel – to adjust the seat position – in the aisle-side armrest. A decently sized tray table was stored away in the other armrest, with a remote control for the in-flight entertainment system above it. In front of the seat was a large 18 inch (45 cm) TV screen. There are a lot of storage compartments in the suite, including one with a useful mirror in it. In the seated position, it’s hard to imagine a Business Class seat done better. However, when it comes to sleeping starting with the complicated way to turn it into a sleeper bed which involved putting the seat into its upright position, standing up yourself, and then manually fold the seatback forward. The cabin crew are there to help and will make up the bed for you (thankfully!). Once flat, you need to lay diagonally on the bed and force your feet in a narrow cubby to stretch straight. This means the bed is not comfortable for travellers who prefer to sleep on their side. The only exception are the bulkhead seats on row 11 and 19, which feature a full-width ottoman (center seats) or larger foot rest combined with an ottoman (window seats) instead of a narrow footrest, and are thus the best seats on the plane (and far superior to all other Business Class seats). Another problem with this Business Class set up is that once you are committed to the bed, there’s no way back. If you wake up and want to revert back to a regular seat, your bed is gone. 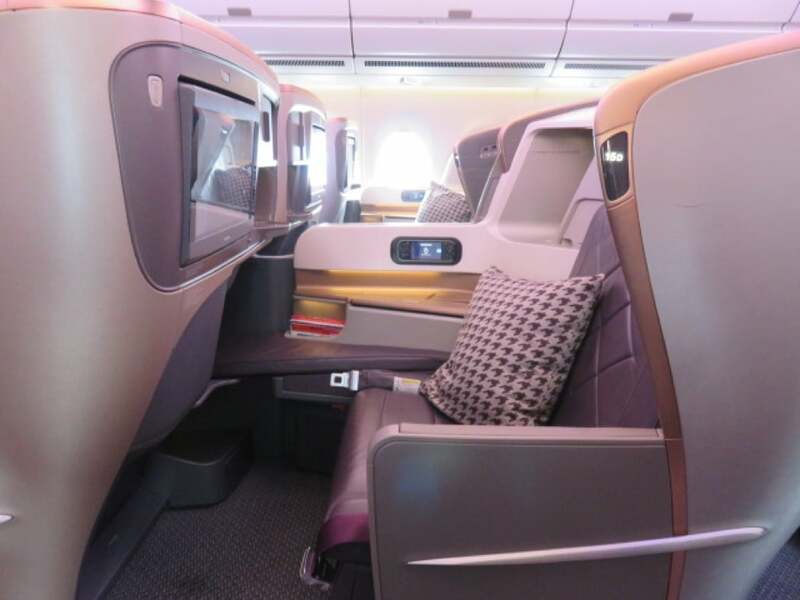 What are the best Business Class seats on Singapore Airlines’s A350-900? Window seats are the best option for solo travelers since they provide a little more privacy, while travel companions should go for the center seats. Bulkhead seats on row 11 and 19 are far superior to all other seats since they feature a full-width ottoman instead of a narrow foot rest, allowing a much more comfortable sleeping position. The seats from row 19 to 22 are located in their own little private cabin and are therefore highly recommended. I suggest avoiding the window seats in row 17 and centre seats in row 18 due to their proximity to the galley and lavatories. Row 22 because it is also located in front of the Premium Economy bassinet seats (so you may end up being close to young children). Unfortunately, Singapore Airlines doesn’t offer amenity kits in Business Class on any flights. Passengers in the premium cabin only receive slippers, socks, and eye shades. Bathroom amenities – such as shaving kits, toothbrushes, toothpaste, hand lotion and perfume – are available through in the toilets. Noise cancelling headphones are provided, although you can not take them home with you. 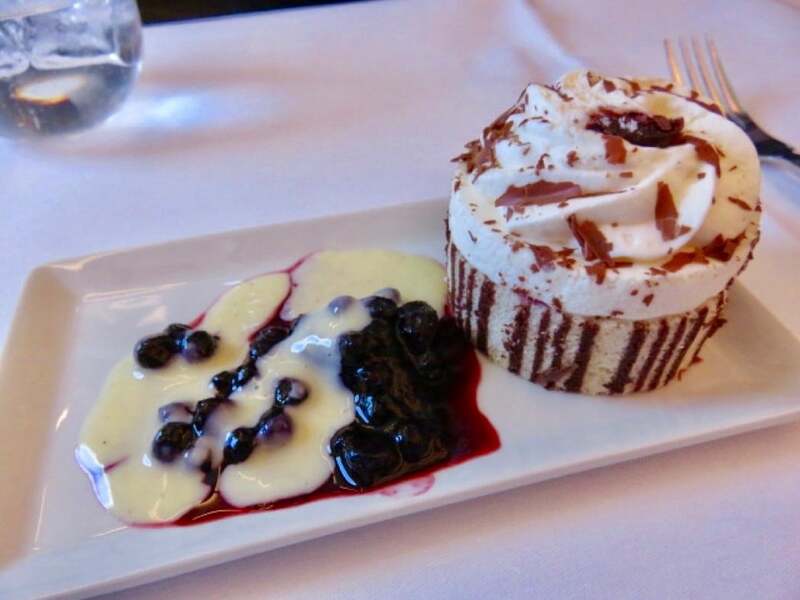 Singapore Airlines enjoys an excellent culinary reputation, and collaborates with world-acclaimed chefs who own Michelin-starred restaurants. 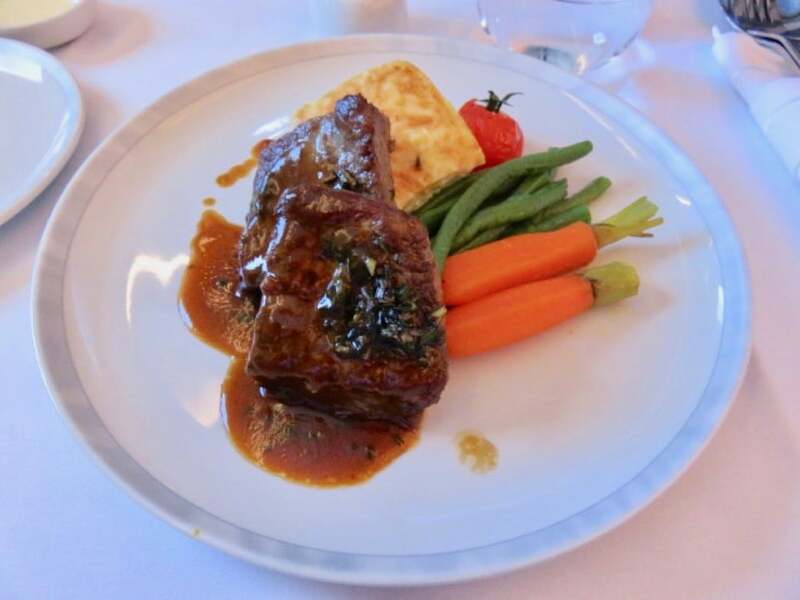 The airline is famous for its ‘Book the Cook’ service where you can select your gourmet main course from a premium selection of dishes at least 24 hours before departure. 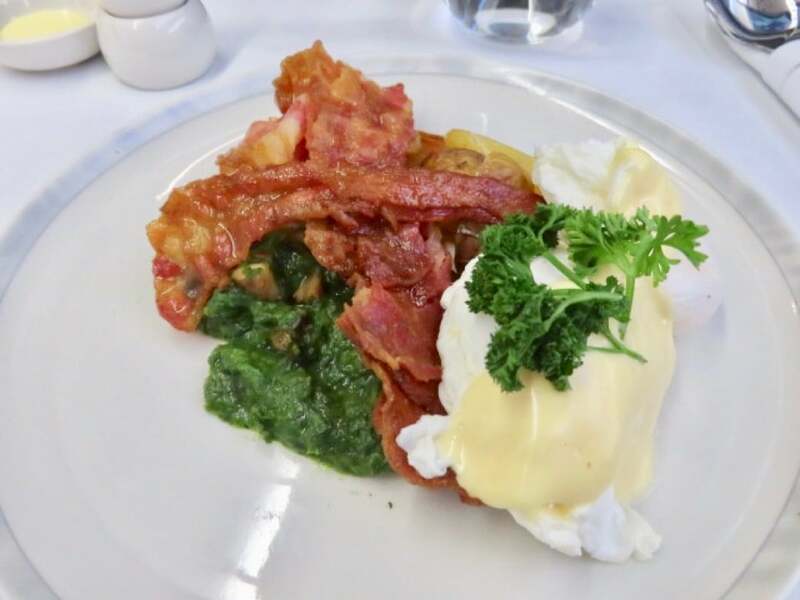 Unfortunately, the ‘Book the Cook’ service was not available on this Düsseldorf to Singapore route, and while the food was excellent, I was not blown away by the meals. Singapore chicken and lamb satay, with onion, cucumber, and spicy peanut sauce. After dinner, the crew passed by with a fruit bowl and a chocolate box, from which you could choose a selection. 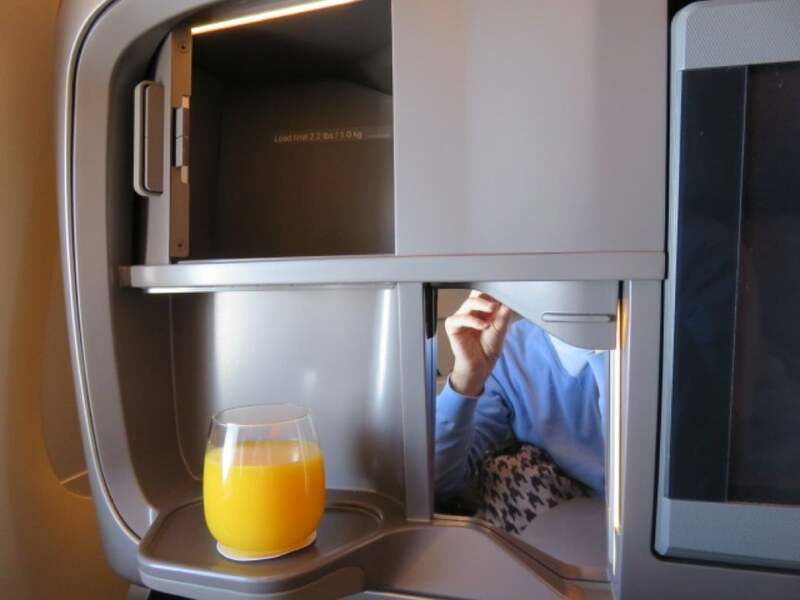 The Singapore Airlines A350 does not feature a walk-up bar, but you can order snacks from the menu at any time during the flight. 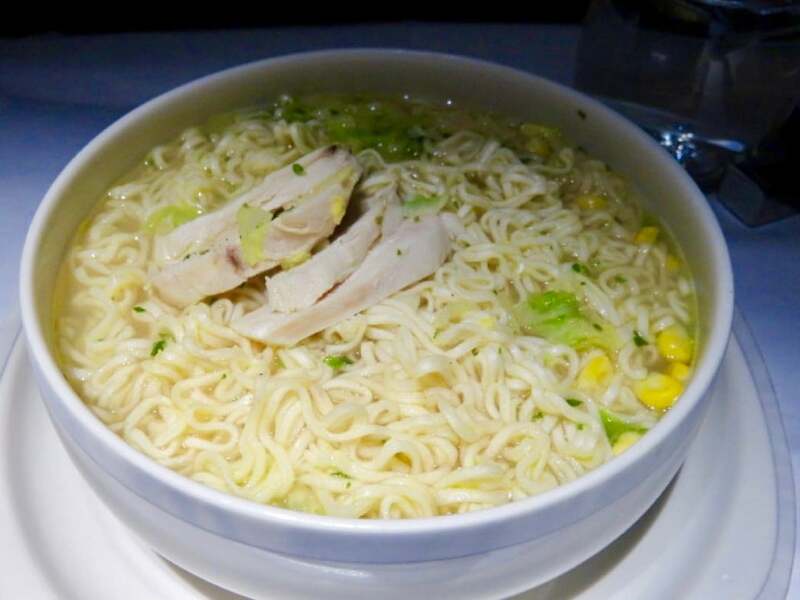 Mid-flight, I ordered Oriental noodles with chicken and black mushrooms – which tasted good. The 18 inch (45 cm) LCD screen in front of each Business Class has no touchscreen function and you need to use a video touchscreen handset located above the armrest to work Krisworld, SQ’s inflight entertainment system. The latter features an impressive selection of 1,000 entertainment options, with loads of movies, tv programmes, music, games and apps. Wifi is available on Singapore Airlines’s A350 and of reasonable speed. WiFi was not complimentary and charged at: US$11.95 for one hour; US$16.95 for 3 hours; and US$21.95 for the entire flight. Singapore Airlines cabin crew – both male and female address every customer by name and are consistently excellent. 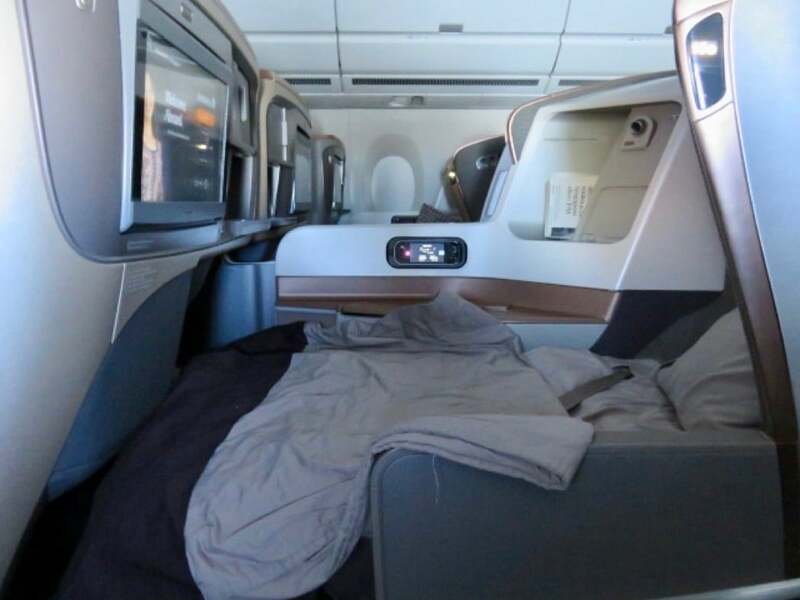 For a comparison, you can read my other Singapore Airlines First Class flight reviews and Singapore Airlines Business Class flight reviews.